This is a no-cook fudge and couldn't be simpler. In 3 simple steps you will have a great addition to your Christmas meal. Break or chop the chocolate into small chunks and place in a non-stick saucepan with the condensed milk. Melt the ingredients gently over a low-medium heat, stirring occasionally until smooth and silky. (Alternatively melt in the microwave in 10-20 second bursts, stirring frequently). Pour into the tin to set for 1 hour in the fridge. When the fudge is set, sprinkle the work top with a little icing sugar. Using a 3cm round cutter, cut into rounds, then place on a baking sheet lined with baking paper. Re-chill for 30 minutes. Knead any off cuts with a few drops of colouring. 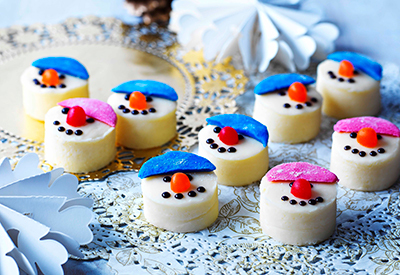 Decorate with the black icing to make snowman faces. Roll out the coloured fudge thinly to make hats and scarves, brushed with a little water to stick to the fudge. Chilling time: 1hour 30 minutes Store in an airtight container in the fridge for up to 2 weeks.